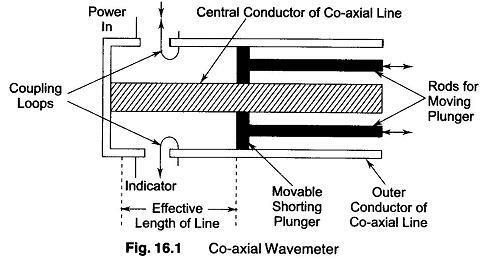 A Resonant Coaxial Wavemeter line such as illustrated in Fig. 16.1 and operating as a resonant system can be used to measure frequencies in the range of 600 — 10,000 MHz. At lower frequencies the cavity becomes excessively long and at higher frequencies the dimensions become very small. The arrangement illustrated is of the transmission type. It has two coupling loops, one for feeding power into the line through a co-axial cable, and one for coupling a crystal rectifier indicator to the oscillators in the cavity. Tuning is accomplished by varying the position of the short-circuit plunger, using a lead screw. Provision is made for accurately measuring the resulting displacement of the plunger. where Δl is in metres. At lower frequencies, the co-axial line is ordinarily adjusted to be exactly half a λ long. In this case, it is necessary to make a calibration of frequency as a function of line length. The accuracy of co-axial wavemeters can be quite high (values of 0.05%). This accuracy is a result of the fact that the Q of a co-axial resonator is very high.